Kate DiCamillo is the author of THE MAGICIAN's ELEPHANT, a NEW YORK TIMES bestseller; THE TALE OF DESPERAUX, which was awarded the Newbery Medal; BECAUSE OF WINN-DIXIE, a Newbery Honor book; and six books starring Mercy Watson, including the Theodor Seuss Geisel Honor Book MERCY WATSON GOES FOR A RIDE. She lives in Minneapolis. Alison McGhee is the award-winning author of books for all ages, including SONG OF MIDDLE C, illustrated by Scott Menchin; the #1 NEW YORK TIMES bestseller SOMEDAY, illustrated by Peter H. Reynolds; the young adult novel ALL RIVERS FLOW TO THE SEA; and the adult novel SHADOW BABY, a TODAY SHOW Book Club selection. She lives in Minnesota. 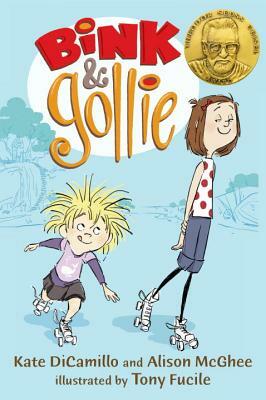 Gollie is reed thin, geeky, and archly judgmental; Bink is petite and down to earth...<B><I></I></B>The plots serve mostly as a framework for DiCamillo and McGhee's sharp, distinctly, distinctly ungirly dialogue that makes every page feel like a breath of fresh air. And true to his background as an animator for Pixar and Disney, Fucile makes his inklike digital illustrations crackle with energy and sly humor. Reality is gleefully suspended here...appealingly oddball elements (roller skates, pancakes, rainbow socks)...expressive, cartoon-style drawings, including several wordless spreads, extend the sense of character, story, and madcap adventure. Children will have fun filling in all the spaces this high-spirited, quirky, and warmhearted offering leaves to the imagination. r.
Entirely successful in portraying the bumps in the road and bruised feelings that can come with friendship. The rewards, though, are also apparent...Fucile’s unfussy digital illustrations with lots of white space perfectly highlight this odd couple’s particularities. An especially overt love letter to friendship...One of those books that doesn’t fit neatly into any category....But wouldn’t you be proud if you spied your 6-year-old daughter rehearsing such lines as ‘Bink: I implore you, do not knock.’ Indeed you would....Who says simple words must come first to readers?....Love of language is one of the tried-and-true ways into the reading life. An effervescent and endearingly quirky chapter book by Kate DiCamillo and Alison McGhee....Both writers are known for their amusing and sometimes arch narrative style, and here, in three short chapter-stories, they give us two girls who delight and vex each other in equal parts....Tony Fucile's illustrations of the girls are comic and full of zip.